”Neuroplanets” is a project which explores the aesthetics of information on sound. Initially based on multiple ways of audio analysis in rare sonic phenomena taking place on other planets, this project has been developed and executed by applying data and numerical elements from Neurosciences, on tracks commissioned from BJ Nilsen, Daniel Menche, Francisco López and Mika Vainio. More info on ”Neuroplanets” can be found here. Neuroplanets is the latest entry in Sub Rosa’s New Framework Series, which is itself a subset of the label’s Concrete Electronics Noise. These matryoshka-like layers serve as an apt parable of the music itself, based on source material donated to sound artist Thanasis Kaproulias (Novi_sad) by BJ Nilsen, Daniel Menche, Francisco López and Mika Vainio. One can approach the music – and yes, it is fair to call these soundscapes music – from either direction. When approaching from the outermost layer, Neuroplanets is a fine quartet of soundscapes that easily could be mistaken for drones. Approaching from the innermost layer, the album is a collection of elusive, ephemeral phenomena, seldom heard even by the most attentive of ears. At this level, one might call Neuroplanets a science fiction album, with an emphasis on the science. Over the years, we’ve sent so much cluttering noise into space, polluting the solar system’s natural soundscape, that it’s only fair to take some home with us. (And who knows where Voyager’s golden record is now?) A strange fascination comes with the fact that the sounds of interplanetary weather systems have been condensed to 0s and 1s, copied to a disc, and duplicated, thereby increasing the chances that they will be beamed back out into space. Imagine the sound of all 500 copies being played at once, each starting in a different spot, like old waves receding, crashing into the new. Novi_sad applies this data to that data, agitating the sonic pot. The two sets seem to have little in common, but Kaproulias seeks to combine them. And who is to say that they are unrelated? If we are all “made of stardust”, then there must be a connection. Now add the thought that the recent surge in everything from peanut allergies to A.D.D. may eventually be traced to the ingestion of plastics that humans have injected into their own environment, and the tenuous begins to sound reasonable. Of the four tracks, only the last (source audio from Mika Vainio) sounds truly disturbed; its darkness flattens as it descends into an abyss of thump and mire. One can’t help but ask if this is the sonic representation of the abyss gazing into us. What is the music without the explanation? Kaproulias clearly worked very hard to produce this work, meticulously designing a crafted artifact and its accompanying online text. And yet, many people will simply skip to the samples. While this sort of approach may be maddening to an artist, in this case it won’t hurt. The claustrophobic closer is itself worth the price of admission. If one just listens, one might describe Track 4 as a drone piece in which the synthetic elements clear like mist, making way for a drum and a parasitic chime. Within minutes, the clouds swallow them whole, but they eventually knife through it like a foreboding peak. In similar fashion, one might approach the other pieces with metaphors, ignoring their genealogy. One might even make musical comparisons. For example, the factory-like noises of Track 3 could easily be mistaken for the pulse of an early Einstürzende Neubauten track. But one can enjoy this collection for its sound as much as for its construction; after all, the moon is just as beautiful to a child who thinks it is made out of cheese. In actuality, this is a classic case of words meaning very little. For several reasons. The first translates as “look at the names of the participants”, already warranting sympathetic perceptual experiences and advanced acoustic properties defining the sensorial width and the artistic significance of the original gesture. This – needless to say – includes the project’s mastermind Thanasis Kaproulias, whose relatively scarce number of available recordings is inversely proportional to their upper-class sonic content. Then again: how can a writer produce a serviceable assessment without repeating what’s distinctly explicated by the conceiver on the album’s notes? (Answer: you plainly restate them by merely changing the style, as anyone can see most everywhere on the web). A third possibility would be the “comparison way”, but there’s pretty much nothing around these days to be reckoned as homologous to these four profoundly rumbling-hissing-and-roaring tracks. At any rate, they deserve more than a superficial rehashing of the obvious, being clearly superior to many vaguely akin ejections floating around this sphere of psychoacoustic research. Right, a few distinguishing traits from the contributors are detectable in the mixes (although Menche’s segment – a momentous crescendo of pressure culminating in choral undulation – is less typical than expected). Perhaps a correct reading might reside in a similarity between Neuroplanets and a chronological sequence of life phases, starting with BJNilsen’s “borderline minimalism” gradualness flowing into stirring magnitude, transiting across López’s hammering reiterations born from the ashes of subterranean quaking, concluding with Vainio’s harshly penetrative distortions that nevertheless set off a sort of “strained absence mode” in our somatic position, ending matters in unequivocal quietude. Aside from the anticipated stunning phenomena stemming from the modification of antipodal frequencies and the mutable dynamics applied by Novi_sad, what’s truly striking is the manifest contradiction of sounds related to the failure of nonfunctional human parts that, together with other kinds of concealed yet vivifying unearthly substances, manage to bring forth the opposite result: a “center ground” founded on the constant provision of enlivening signals, at the same time compelling, pathologic, and quite enlightening. Novi_sad transforms varied source material from Mika Vainio, BJ Nilsen, Daniel Menche and Francisco López with vividly visual results. With sources from BJ Nilsen he uses audio analysis on winds, sandstorms, and dust devils applied with data from functional anatomy of schizophrenic patients with auditory hallucinations resulting an almost cinematic panorama of expansive pads and blustering toxic distortions. Using audio analysis on ghostly planetary plasma waves from NASA and data applied from patterns of music agnosia associated with middle cerebral artery infarcts, Daniel Menche’s source is rendered as a hollowed, resonant chamber perfused with detailed noise interference. To Francisco López’s material, he employs audio analysis on the whistle of ultra-cold liquid helium-3 that changes volume relative to the North Pole and Earth’s rotation with data applied from rightward and leftward bisection biases in spatial neglect, manifesting slow, swooping technoid pulses, roiling noise and billowing dub-techno like chords, Mika Vainio’s offerings are rendered as a cloud of prickly noise and glowering deep black tones using audio analysis on decametric noise storms and radio storms on Jupiter, and applied data from neuroimaging with bipolar disorder and children with serious emotional disturbances. Recommended! Thanasis Kaproulias has been quietly building an impressive repertoire of conceptual sound art releases for the past few years. Neuroplanets may perhaps be the most varied and complex release yet, by not only utilizing source material from four titans of the field (BJ Nilsen, Daniel Menche, Francisco Lopez and Mika Vainio) but also applying data from neurological and astronomical research into his compositions. The end product is something that sounds more like a collaboration where the original artists’ sound is measurable, but also Kaproulias’ reworking as well. Unlike his last release for the label, Inhumane Humans, Novi_sad does not work with as much overt noise and dissonance, although those things do crop up tastefully throughout. The first piece allows BJ Nilsen’s careful, understated touch to sound to be prevalent in the form of buzzing and ghostly passages of sound drifting through, occasionally bringing along the hint of a melody that slowly dissipates into the ether. Eventually the piece builds to a dense and heavy blast of digital noise, but used as a tasteful climax rather than an overused stylistic choice. In more of a departure, the material provided by Daniel Menche sticks to the high end of the spectrum, and also has the sound of being recorded in a massive, abandoned warehouse. Considering Menche’s work is so often of a very organic nature, and heavy on the bass, it is a different recording than I was expecting. The piece (meshed with data of plasma waves from NASA and patterns of music agnosia) ends up with a denser, heavier sound that is more of a product of its spaciousness rather than the actual abrasiveness of the sound, as counterintuitive as that may sound. Kaproulias’ work with material from Francisco Lopez demonstrates the Spanish composer’s touch early on, with near silence and subsonic rumbles to slowly build the work from almost nothing. However, the collaborative element becomes clear when metallic, grinding rhythmic scatters and noises appear, locked into some sort of ersatz rhythm that becomes sharper as the piece clicks on. By the end, it sounds like a recording from within a factory, with all associated noise and distortion. The final composition is built on recordings from Pan Sonic’s Mika Vainio in a work dense with digital noise and what sounds like bits of a malfunctioning guitar cable. There is a heavy electronic sheen to everything, and with the use of guitar-resembling sounds it fits with Vainio’s recent works. Throughout this piece there are rising and falling ultra sonic blasts that are balanced by more peaceful, shimmering sounds, but ending the piece in a rather painful outburst due to the processing of Kaproulias. How exactly the use of neurological and astronomical data shaped these four compositions is not at all clear. Being that it is not too difficult to hear the source material Kaproulias used from other artists, my curiosity of course was to how the processing was handled. Knowing the answer to that is not a necessity, however, and Neuroplanets is a strong piece of occasionally harsh sound exploration even without its conceptual trappings and appearances by other artists. Novi_sad’s work sounds even more singular and self assured than before, with him firmly establishing himself amongst the most noteworthy artists in the field. The sound sources of this album originate from some recordings made by BJ Nilsen, Daniel Menche, Francisco López and Mika Vainio, but the tracks have come together through the additional manipulations of Novi_sad. In Neuroplanets the experimenter employs a continuous and heterogeneous technique of audio analysis followed by something referred to as “applied data”. This “applied data” has been defined by a number of parameters describing the functional anatomy of schizophrenic patients who have been suffering from audio hallucinations and some agnosia music. Agnosia is a problem with perception characterized by a lack of acknowledgment of objects, people, sounds and forms. The pathology is also associated with heart attacks located in the middle cerebral artery. The audio materials provided by Francisco López instead involve the ultra-cool screech of helium-3, a very rare isotope. This is applied to data related to clinical pathologies and typical cases of neuro-anatomical diseases. In the Mika Vaino track, the sequences of the decametric noise emissions and radio storms on Jupiter are correlated with neuro-images of bipolar diseases of children with heavy emotional dysfunction. Among the cuts a Ballard aesthetic seems to be present; the dividing line between internal and external landscapes falls down. There are fragmented and unhealthy sounds, mood swings, and some disturbing but magnificent passages – this is a deep exploration of the vibrational aesthetics of some unusual audio phenomena. The elective correlation between music, science and mathematics has already been widely canonized and this match has been an almost protocol conceptual framework for a plenty of electronic musicians so that many listeners and reviewers could considered it as a sort of cubbyhole; “Neuroplanets”, the new project by Thanasis Kaproulias aka Novi_sad released for Sub Rosa’s New Series Framework collection, seems to go beyond a merely conceptualen closure by focusing on the modeling of sonic raw material, which got provided by master craftsmen of sound like BJ Nilsen, Daniel Menche, Francisco Lopez and Mika Vainio, on the basis of applied data and numerical analysis of researches in the fascinating fields of neuroscience and astronomy. The unavoidable accentuation of the mysterious charm of the four resulting soundscapes intersects the outer reaches of these fast-forwarding and somehow psychedelic branches of human knowledge: the repeated sounds which have been rendered from audio analysis of strange meteorological phenomena on other planets (wind, dust devils and tornadoes on Mars, ghostly planetary plasma waves from NASA, a whistle of ultra-cold liquid helium-3, changing volume relative to the North Pole and the Earth’s rotation and decametric noise and radio storms on Jupiter) could let you imagine that what you’re listening by means of your headphones is playing on some very distant places at the same time. The initial project should have “sonically” detected only these strange events, but Thanasis decided to augment his excellent work by implementing data from functional anatomy of schizophrenic patients with auditory hallucinations (! ), patterns of music agnosia associated with middle cerebral artery infarcts, rightward and leftward bisection biases in spacial neglect and neuroimaging with bipolar disorder and children with serious emotional disturbances. Both the uncommon references and transposition and the quality of sonic artifacts by Novi_sad, which reaches the noisiest peaks on the entrancing tracks commissioned from Lopez and Vainio, deliver many shocking frissons on listener’s imagination. Pulling together something of a heavyweight line-up to take some excursions into the depths of ambient noise, Sub Rosa turn to Thanasis Kaproulias to serve up four pieces with different collaborators of high regard in avant-garde circles. Swedish mainstay BJ Nilsen gets involved in the first round of “Source Audio”, and it’s a ghostly yet utterly comforting swirl of dishevelled melody of the most transcendental kind. Daniel Menche is less forgiving, playing a thoroughly long game of oppressive background hum which slowly rises to a cacophony of pure dread and white noise, while Francisco López is equally fierce but in a more direct, abrasive manner that peaks with panting breaths creating a non-rhythm. Mika Vainio brings out the big guns with a towering inferno of distorted chord, ostensibly wrenched from a guitar but quite possibly made of anything. Behind Novi_sad we find Thanasis Kaproulias, who has released before on Staalplaat and Sub Rosa and is perhaps the last laptop artist to acquire some fame. 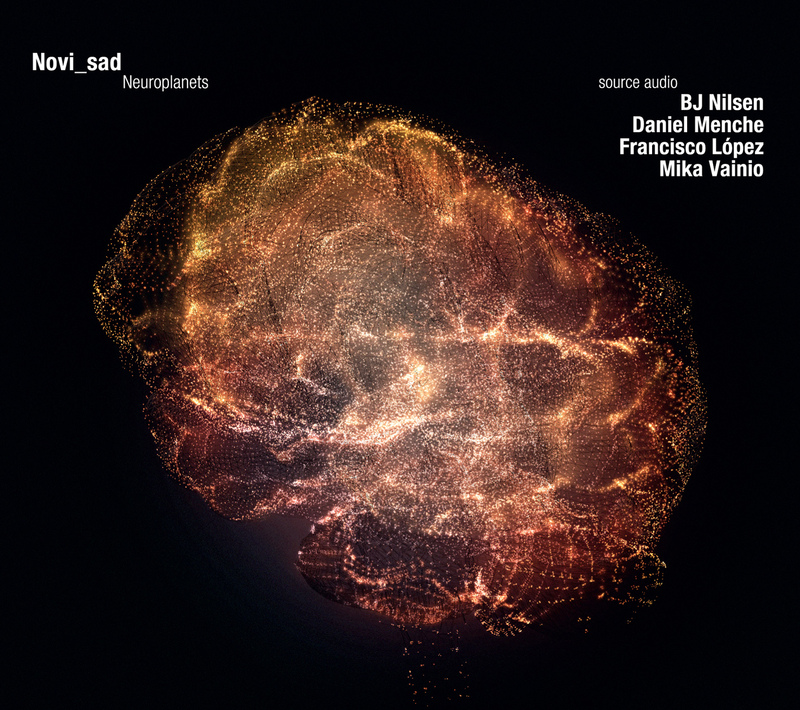 Usually I look for some older reviews and search the folder that Vital Weekly, and in 2011 I found a concert announcement of Novi_sad that read: “Neuroplanets” is an audio project which explores the aesthetics of information on sound. Initially based on multiple ways of audio analysis in sonic phenomena from other planets, this project has been developed and produced by applying data from Neurosciences on tracks commissioned from: BJ Nilsen, Daniel Menche, Francisco López and Mika Vainio.”. Now this finally released in the young composers series of Sub Rosa. I must admit I am afraid I don’t get this CD very well. Not because it’s bad, far from it actually, but because it’s all quite ordinary laptop music. The sound input by his four colleague’s are easily to spot and typical of them, but Novi_sad processing is rather normal. Lots of equalization on the sounds, layering a few radical blocks of these equalized sounds together – very high end, very low end – into lengthy sustaining blocks of sound. Music that reminds you of Fennesz being very ambient, early Stephan Mathieu, Tim Hecker and such like, and perhaps less of find musique concrete composer, which is something that Novi_sad would no doubt be. As said, the music as such is not bad at all, but it’s all something that you may have heard well enough before.